Why do your kids or pets make a mess on your freshly cleaned carpets? Or you get your carpets looking great for your party only to wake up in the morning to spilt drinks or muddy foot prints all over your freshly cleaned carpet. Now you dont have to zip down to the supermarket to hire the DIY carpet cleaner!!!!! This is why we are now offering this EXCLUSIVE OFFER - UNLIMITED PROFESSIONAL CARPET CLEANING @ $9 per room for a whole year. You can book online to pick a date & time that suits you, or Call us to book a time convenient to you, because you have our Exclusive carpet cleaning guarantee you can leave the carpet cleaning to the experts. After the initial clean you will receive our guarantee certificate with a reference number and expiry date. You can now book us as many times as you like for the Exclusive $9 per room. Thats right for the entire year we will come back and clean the carpeted rooms covered under our guarantee for $9 per room plus a small call out fee each visit. All you need to do is call us and we will come out at your convenience. All customers that spend $115.00 or more on their initial professional carpet cleaning will automatically receive our guarantee (Some Exclusions See Below). On the initial visit we will pre inspect, pre vacuum, pre spray, spot clean stains, and hot water extract your carpets. When we come out to clean your carpets under the guarantee, YOU will need to clear and pre vacuum the areas before we arrive, we will re clean the areas covered under the guarantee for $9 per room plus the small call out fee. 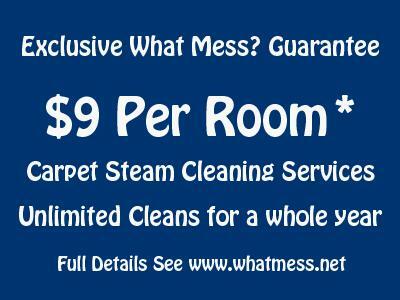 This offer is exclusive to What Mess Cleaning Services and it now makes maintaining your carpets affordable. Keep you carpets looking and smelling fresh all year round. Call What Mess Cleaning Services today and schedule your carpet cleaning service. Remember its unlimited for the whole year. NOTES : You will need to clear all the areas and pre vacuum before we arrive, This guarantee only covers the carpets we have cleaned in your initial clean, a small call out fee of $39.00 applys to all visits.